Despite the sticker’s grim assessment and a pervasively anachronistic color scheme, Bowling Green boasts a fascinating history, a kaleidoscope of events large and small that form its unique story. The city is home to the country’s lone Corvette production facility, for example, responsible for all Corvettes produced in the US since 1981. (Unfortunately, on February, 12, 2014, a sinkhole suddenly opened up in the facility’s on-site museum and swallowed some of its most historic cars.) And chronicling much of Bowling Green’s history is the folklore department of Western Kentucky University, one of the few major academic venues for studying folklore in the US. As one graduate student explained, no, WKU’s folklorists don’t just collect ballads and study fairy tales, they study all manner of cultural minutia, including Furrie culture, the “It” denomination in children’s games, and the role rumor plays in the spread of HIV. But one of the most crucial and unexpected parts of the city’s folklore is celebrated on highway US31 West, which takes travelers from Bowling Green on down to Nashville. A monument on the highway commemorates the former home and office of the man for whom a stretch of the highway is named. The “Duncan Hines Scenic ByWay” is named after none other Duncan Hines, founder of the eponymous line of cake mixes and kitchen goods and one of Bowling Green’s most illustrious citizens. Hines, who was born and raised in Bowling Green, didn’t start out as a cake mix kingpin but rather as a traveling salesman for a printing firm. It was a vocation that meshed well with his hobby of writing restaurant reviews, as his long jaunts on the road afforded him the opportunity to eat at dozens of restaurants a month. Hines compiled his reviews and self-published one the first restaurant guidebooks for travelers, and his opinions eventually became so widely respected that restaurants all over the US could be made or broken depending on his review. His renown led to the extensive line of foods that still bear his name. It is fitting that Hines has a highway named in his honor, as the open road was his inspiration and his office, but the honor also reflects his impact on travel and food writing. He kept his notes for fun with no inkling of the success he’d later see, a practice that any dedicated writer and traveler can understand. And his success with self-publishing is an uplifting example for writers of any stripe, as his fortune came entirely from the chance he took printing and hawking his own work. Hines was known to be a mercurial snob, but he also forged for himself the completely enviable life of traveling, eating, and writing. 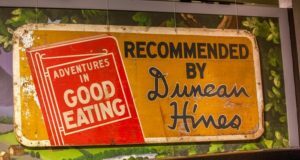 Hines would turn 138 this year, and this article examines the interesting life of Duncan Hines on the occasion of his decitrioctocentennial birthday. One of ten children, Duncan Hines was born in Bowling Green on March 26, 1880, to a prominent area family that included a father who served in the Confederate army. 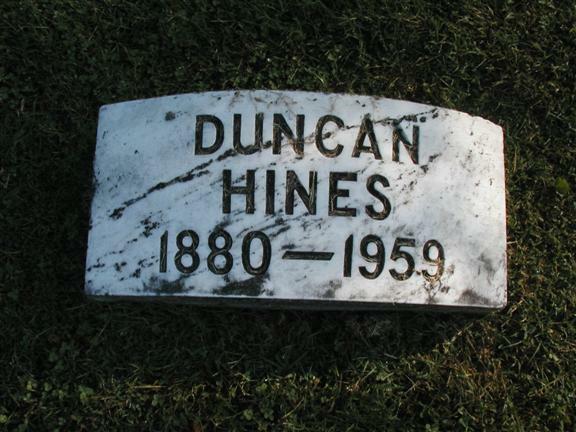 Hines’s mother died when he was a child, leaving young Duncan to be raised by a grandmother who plied him with a steady stream of “apple pie, pecan pie, country ham, candied yams, turnip greens with fatback, beaten biscuits and cornbread,” as he later recalled. Hines attended what would become Western Kentucky University, and following graduation, he worked his way through jobs and landed a gig as a traveling salesman based out of Chicago. Hines, a proud eater from an early age, made a hobby out of one of the ancillary benefits of his job – he kept a diary of the restaurants he visited while out on the road. Hines noted details such as hours, exact location, availability of air conditioning, and his favorite dishes for the next time he passed through. Hines also took note of a restaurant’s cleanliness, as there were no federally-mandated cleanliness standards governing restaurant kitchens at the time. After a number of years eating on the road, Hines found that he had not only amassed records on a sizeable amount of restaurants all over the country but that his friends, knowing of his hobby, were always bugging him for restaurant recommendations. So Hines and his wife Florence turned his notes into a pamphlet that he sent out with their Christmas cards. Acclaim was so great for the list of “supreme eating places” that Hines began charging for the pamphlet and then decided to turn it into a book. His book, released “with mingled temerity and pleasure,” was so successful that within ten years the book had gone through thirty printings. Western Kentucky University graduate Louis Hatchett explains in his biography Duncan Hines: How a Traveling Salesman Became the Most Trusted Name in Food that Hines would order 11,000 copies of the book at a time and distribute them himself. He lost money on the first two printings – he printed five thousand copies at a personal loss of thousands of dollars – but earned a respectable middle-class living from the third printing on. The secretaries Hines hired to work from his home answered at least a thousand letters per week, as mail poured in from people with restaurant recommendations of their own. Of course, more restaurants to review ensured endless updates to the book, and the book became an annually-updated (and still self-published) affair for the few decades. Hines didn’t visit all the restaurants personally but relied on trusted and persnickety restaurant connoisseurs to keep him abreast of what was good and what was terrible (and to help distribute the books). His ‘Dinner Detectives,’ as he called them, were friends and strangers, and included the inventor of Southern Comfort liqueur, who would serve dinner on gold dishes that once belonged to the Czar of Russia when the Hines came to dine at his house. Recommendations written by the Hines’ close friends the Singmasters were so adroit and so attuned to Hines’ own tastes that they went into the book “no questions asked.” At the book’s height, Hines had 400 Dinner Detectives working for him. Jonathan Jeffrey, the Department Head for Library Special Collections at Western Kentucky University, says that Hines’s background as a printing salesman gave him the insight into self-publishing that he needed to make himself a success, and Hines’s list of publications grew with his fame. 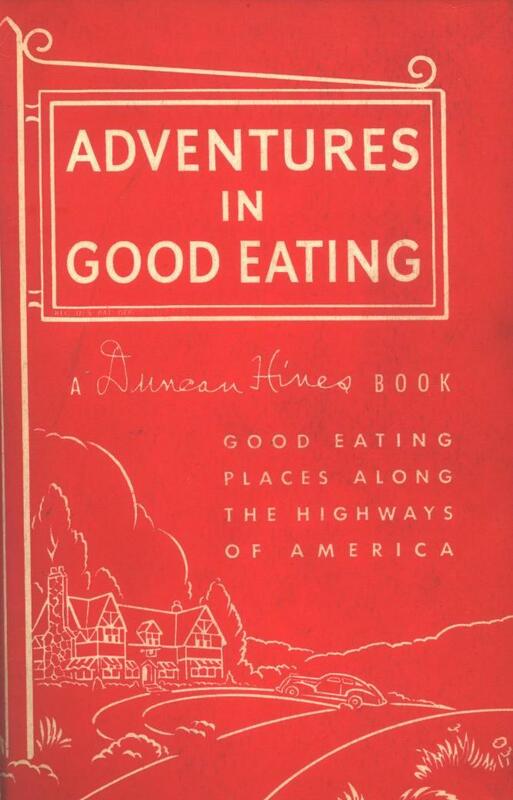 In 1938, he began publishing Lodging for a Night, a hotel guide; the first volume of an annually-updated cookbook called Adventures in Good Cooking came in 1939; while Duncan Hines’ Vacation Guide and Duncan Hines’ Dessert Book debuted respectively in 1948 and 1955. The cookbooks were huge in their scope: the first Dessert Book, for example, contained 555 recipes, including one hundred for pies and forty for custards. A Duncan Hines line of ice cream, the first Hines-brand product, debuted in 1950, and the famous line of cake mixes came started in 1951. In 1953, Hines and business partner Roy Park formed a company that licensed his name to a wide variety of products, and in 1957 the Duncan Hines brand was sold to Proctor and Gamble, which distributed the name even further. In short order, there were over 150 Duncan Hines-brand food items. The cake mix for which he is most famous muscled its way to control ten percent of the cake mix market in only two years. Hines was fastidious about how to prepare the products bearing his name, and insisted on writing the instructions for how to prepare items like Duncan Hines brand coffee. Ironically, Hines could not cook at all. He grew up with his grandmother’s cooking, and as a salesman, he mostly ate on the road, obviating the need to cook for himself. At the brand’s height, annual profits were upwards of $411 million in today’s dollars, partly because Hines products were significantly richer than their competitors’. (The cake mix was a success because it called for the chef to put in the eggs, Jeffrey explained. Other mixes contained powdered eggs, with unimpressive results.) Jeffrey says he could never get a definitive account of how much Hines was actually worth, as the gourmand made a point to keep it quiet. (Hines was known to say things like he only made an eighth of a cent off of every cake mix, but would then note that tens of thousands of cake mixes were sold each minute.) With his earnings, he bought the expansive property now commemorated outside of Bowling Green, replete with a grand porch intended to copy that of George Washington’s Mount Vernon. Hines was so trusted that readers asked him to co-sign on property purchases and was said to have better name recognition than the Vice President. But this didn’t hinder his career by any means. Hines and his wife Florence traveled 50,000 miles per year doing research for of Adventures in Good Eating, seeing new cities, meeting interesting people, and trying the cuisine of every corner of the USA. As Hines laconically put it in The Dessert Book, “I am in the fortunate position of being a professional taster.” They footed the bill for these travels themselves, as to again avoid any perception of bias, and he also used an old picture of himself in his books to minimize the chance he’d be recognized. One of the presumable downsides to being a food critic is the inevitable weight gain – Jeffrey notes Hines had a “fetish about butter and fresh eggs” – and Hines made sure to take three months off every year to get himself back in shape. (This was a viable plan, it seems, as the 1946 Life profile attests to his “well-preserved figure.”) But it wasn’t the pies and steaks that caught up with Hines but lung cancer: Hines died on March 15, 1959, two weeks shy of his eightieth birthday. New editions of his books were published until 1961 and then the series slowly faded to obscurity (though some editions are now sought-after collector’s items). Unlike Betty Crocker and Tony the Tiger, Duncan Hines was in fact a real person, and one whose hobby ended up changing restaurant culture as a whole, and almost certainly our health and wellbeing in the process. Whatever color scheme Bowling Green chooses to paint itself (or the number of Quonset huts that dot city streets), the city has a hero in this man because he made real a fantasy that no doubt exists in many of us: he forged for himself the unimaginably cool job of traveling and “eating his way across the country,” and he made himself very wealthy in the process. “Without a doubt, Duncan Hines is the most famous and long-lasting name that has come out of the Bowling Green community,” Jeffrey says. His legacy lives on, in Bowling Green and beyond – simply consult your grocer’s shelves! According to visitbgky.com, the road is worth checking out: “The Duncan Hines Scenic ByWay has been written about in numerous publications, including a Reader’s Digest coffee table publication featuring scenic drives and byways throughout the country.” It’s also worth mentioning that Hines’s former residence is now a funeral home. In which he recommended proprietors not rent rooms to people without luggage. Though obviously revered for his culinary opinions, his alcohol tastes were suspect (and appears to have been the result of him unexpectedly enjoying a prank pulled on him by his wife). His favorite drink was reportedly a “Mrs. Hines’s cocktail,” which was comprised of the juice of a watermelon pickle, a whole egg, cream, gin, grenadine, orange-blossom honey, and lime juice. By his own admission he said he could drink more twelve of these concoctions in a sitting.